CINCINNATI (AP) — Jeff Driskel headed directly from the practice field to the podium in the media room and headed for Andy Dalton’s usual seat. In countless ways, the third-year quarterback has entered a new frontier. Until last Sunday, he’d never gotten into a game because of an injury. He’s practicing with the Bengals‘ starting offense this week for the first time all season. 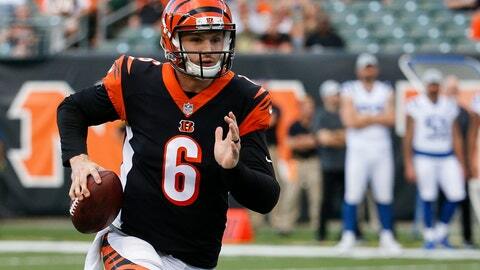 And on Sunday, he’ll make his first career start against the Broncos (5-6) at Paul Brown Stadium in a game the Bengals (5-6) need to win to maintain any hopes of reaching the playoffs. “All right!” he said, settling into a chair behind the microphone. He’s been waiting a long time for such a chance. Driskel was hoping to lead the Florida Gators after Tim Tebow’s departure, but he broke his leg and wasn’t able to win the job. He transferred to Louisiana Tech for the 2015 season, threw for 4,033 yards and was drafted by San Francisco in the sixth round. The Bengals claimed him off waivers before the 2016 season. They liked his arm, his mobility and how he responded in pressure situations, keeping him as the No. 3 behind Dalton and AJ McCarron. Last year, he broke his passing hand in the final preseason game and hurt his non-passing arm while playing the role of receiver during practice late in the season. McCarron won a grievance and became a free agent after the season. Driskel competed with Matt Barkley for the backup job during training camp, getting it when Barkley hurt his left knee in the final preseason game. Now, he’s got a chance to finish the season as the starter. Dalton is out for the season with an injured right thumb , suffered during a 35-20 loss to Cleveland on Sunday. Driskel knows it’s an opportunity that could be a turning point in his career, even though he can’t think of it that way. His biggest challenge this week is not allowing the pressure to bother him. “Just stay relaxed,” coach Marvin Lewis said. He’ll have one advantage. Receiver A.J. Green returned to practice on a limited basis Wednesday after missing the past three games with an injured toe on his right foot. Green said he expects to play on Sunday, barring a setback in practice during the week. Without Green, the offense has struggled in three straight losses. The biggest change in the offense will be Driskel’s ability to run. He threw his first NFL touchdown pass and ran for another against Cleveland, beating a safety to the end zone. “He had a pretty good one on that touchdown run and he said, ‘Well, I wasn’t really running that fast,'” offensive coordinator Bill Lazor said. The Bengals claimed quarterback Tom Savage off waivers from San Francisco on Monday, providing a backup for Driskel. It’s Savage’s third team this season — the Saints waived him in the final cuts. He packed a bag of clothes and arrived on Tuesday. Left tackle Cordy Glenn was inactive for the game against the Browns with a back injury. Replacement Jake Fisher hurt his back in the game and didn’t return. Both were held out of practice Wednesday, along with DE Carlos Dunlap (hip). CB Dre Kirkpatrick (shoulder) and LB Nick Vigil (knee) were limited.